While the Tetrarchy was breaking down, with rival claimants to the throne of the Roman Empire assessing the power of the others, the emperor Galerius sent Licinius I in 307 AD to meet with Maxentius in Rome about his usurpation and occupation of the city. Maxentius accepted the title of Augustus from officers in Rome who promoted him in 306, since he was passed over for the title of Caesar, as was Constantine I (who was raised to Augustus in 305 after the death of his father, Constantius I), in favor of Severus II and Maximinus II Daia. But, Galerius then decided to put Licinius in charge of the eastern provinces and deal with Maxentius himself, after Maxentius defeated Severus II, whom Galerius first sent. The miscalculation Galerius made was many of the troops under Severus II first served under Maximianus, the father of Maxentius. Maximianus came out of retirement and joined Maxentius in Rome to rule jointly. Galerius marched on the city in Summer of 307 with a larger army than what Severus had earlier, but Maxentius used the same strategy of offering the troops money and they also defected, forcing Galerius to retreat. In 308, Maximianus tried to depose Maxentius in Rome, but the troops were faithful to him and Maximianus was forced to leave Italy. Also in 308, Domitius Alexander was declared Augustus in Carthage by his troops, cutting off Rome’s grain supply, and allied with Constantine until Maxentius had him killed c.311. On November 11, 308, Galerius called Diocletian out of retirement to organize a council meeting to sort out roles. Galerius remained Augustus, Maximianus was forced to retire again, Constantine I was demoted to Caesar, Maximinus was appointed Caesar in the East and Licinius was elevated to Augustus in the West. By 309, both Constantine and Maximinus refused to remain demoted and both were appointed Augustus, making four recognized co-Augusti. Maximianus went to the court of Constantine, having nowhere else to go. In 310, Maximianus rebelled against Constantine while the emperor was out on campaign against the Franks, declaring while on campaign in Arles against Maxentius that Constantine was killed in battle. Constantine learned of the rebellion, abandoned the Franks and went to Gaul to confront Maximianus. Constantine arrived, was welcomed in the city, granted Maximianus clemency, but encouraged him to commit suicide, which he did in July 310, eliminating any possibility of Maxentius being declared emperor through rightful lineage. In 310, Licinius took over the war against the Sarmatians and emerged victorious. Galerius died in May, 311, and Licinius entered an agreement with Maximinus to share the Eastern provinces between them, the Hellespont and Bosporus becoming the dividing line of their regions. Maxentius was still in Rome and still viewed as a usurper by Licinius and Constantine. In 312, Maxentius and Maximinus entered an alliance, forcing Licinius and Constantine to enter an alliance as well. Constantine decided to take on Maxentius, where he drowned during the Battle at the Milvian Bridge on October 28, 312, bringing the total of Augusti down to three. Maximinus decided to go on offense and plotted an attack on Licinius. He left Syria with an army of 70,000+ but his army was diminished by the time he reached Bithynia because of weather. He entered Byzantium in April 313 and took the town after an 11-day siege. Heraclea fell next to Maximinus, while Licinius was on the way with only 30,000 troops. When arriving in Hadrianopolis, Licinius had a vision about an angel who told him a prayer that could be used by all cults. 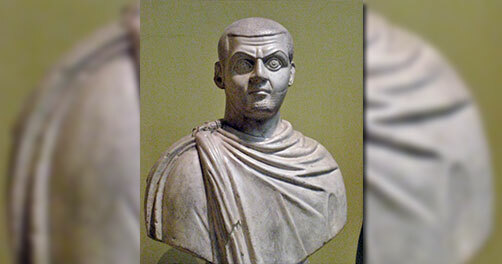 He repeated it to his troops and on April 30, 313 the armies met at the Battle of Tzirallum, where Licinius destroyed Maximinus, forcing him to flee. 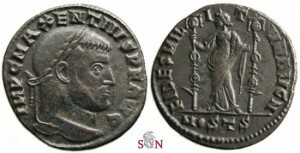 Licinius pursued Maximinus to Tarsus, where he died in August 313, leaving just Licinius I and Constantine I as co-Augusti. MAXIMINUS II DAZA. A.D. 309-313. BI ARGENTEUS. TREVERI. GOOD VF, TONED. RARE. 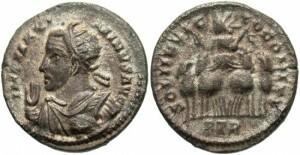 LICINIUS I SILVERED FOLLIS. TRIER. PTR. IOVI CONSERVATORI.